You’ve spent countless hours practicing your technique, tweaking your tone, switching pickups, and trying out pedals. You’ve arrived at a tone that sings, sparkles, bites, or crushes just how you want it to… now what? If the prospect of learning your way around recording gear, techniques, and software sounds like a lot less fun to you, you’re in luck—this article and the video above will walk you through the easiest way to record your guitar rig, as well as a couple options for expanding your sound so that you can get straight to making music. Interested in learning the easiest way to record more instruments? Check out the other tutorials we have in this series: acoustic guitars, bass guitars, and synthesizers. Guitar and mic cables, mic stands, etc. Audio interfaces are available in a dizzying array of shapes, sizes, feature sets, and price points. Fortunately, many small, streamlined, and affordable desktop models are available that suffice for recording guitar. Popular models include the Focusrite Scarlett 2i2, PreSonus AudioBox iTwo, Universal Audio Arrow, and MOTU Ultralite. Whichever brand you go with, make sure your interface has the right types of inputs for what you want to do. Depending on which of the following methods you use, you may need an XLR input with a mic preamp, a high-impedance instrument input, or both. Most compact interfaces (like the ones mentioned above) feature combo jacks that accept both XLR and quarter-inch guitar cables, and onboard preamps with phantom power and pad switches are also fairly standard. Before anything else, you’ll need to get your interface talking to your computer. First, make sure your operating system is updated and install the most recent drivers for your interface—this may happen automatically when you plug it in, or you may need to install them (from an included CD or the manufacturer’s website). Then connect your interface to your computer, open the audio preferences in your DAW, and select the new drivers instead of your sound card. The inputs and outputs available should correspond to your interface. When you’re ready to record, create as many tracks as you need (whether that’s a single mono track with an amp simulator plugin, or a group of tracks for multiple microphones). Assign each track’s input to the corresponding input on your interface, and check that the master output is going to your speakers or headphones so you can hear playback as well as any backing tracks or metronome you might be using. If you crave real amp and cab tone (or if you need to create real feedback), good news: You can easily get a fantastic guitar sound with just one microphone. Chances are, some of your favorite guitar tracks were recorded with just one close mic. This is a studio-standard method for a reason: It gives you a powerful, up-front sound that’s pretty hard to screw up (as long as you have good tone to begin with). When it comes to mic selection, there are as many choices as there are guitars, but they fall into three main categories suited to different applications. Dynamic mics like the Shure SM57 can handle high volumes and have good isolation, meaning they focus on the sound source and don’t pick up much bleed. Condenser mics like the Audio-Technica AT2020 capture much more detail, but their sensitivity makes them prone to picking up other sounds. Ribbon microphones like the sE Electronics Voodoo have medium sensitivity, a unique figure-eight pickup pattern, and are known for their full sound, and often offer a mellower sound because they don't capture the highest frequency ranges. When it comes to mic placement, there are three main parameters you can adjust to shape the tone. First, you can vary the distance from the center of the speaker cone to the edge, which will dictate the amount of high frequencies. You can also point the mic on-axis (directly at the speaker) or off-axis (angled away) to adjust the “punchiness” of the transients. Lastly, getting closer to the speaker will give you accentuated low-end, while moving farther away will sound more natural and “open.” Pro tip: Try a device like the AmpClamp or Audix Cab Grabber to lock in the perfect mic placement. If you’re looking for a complex tone or just want more control over your tracks when mixing, it’s easy to expand your setup to include multiple microphones as well as a DI signal. Adding an additional mic opens up practically unlimited options—you can blend different sounds, experiment with mic placement, introduce a room mic, or get a wide stereo sound—and a DI signal is always good to have as a backup. Your DI signal can come from any point in your signal chain, depending on what you’re trying to achieve. For the purest signal possible, plug straight into a DI box before splitting the signal back to your pedals—you can blend in this clean, snappy sound or re-amplify it later to craft a new tone from scratch. To preserve the sound of your pedals, place the DI just before the amplifier. Lastly, if your amp has a line output or effects loop, you can use it to capture your complete tone minus the speaker cabinet. Mixing multiple microphone and DI signals can lead to some killer sounds, but it can also lead to more problems if you aren’t careful. When using two mics on a source it’s important to know the phase relationship between them to avoid winding up with a strange, hollow sound when you mix the signals together. To avoid phase cancellation, place your mics as close together as possible or utilize the 3:1 rule—place your second mic at least three times as far as the first. DI signals may need to be phase-reversed to cooperate with mic signals. The absolute simplest way to record your guitar rig doesn’t involve an amp or mics at all. Amp and speaker simulation technology has made huge strides recently, and software is now able to model classic gear down to the component level (tubes, capacitors, etc. ), providing unparalleled realism. Plugins like Pod Farm and Helix Native from Line 6, Native Instruments’ Guitar Rig, IK Multimedia’s AmpliTube and Avid’s Eleven are all fantastic choices. 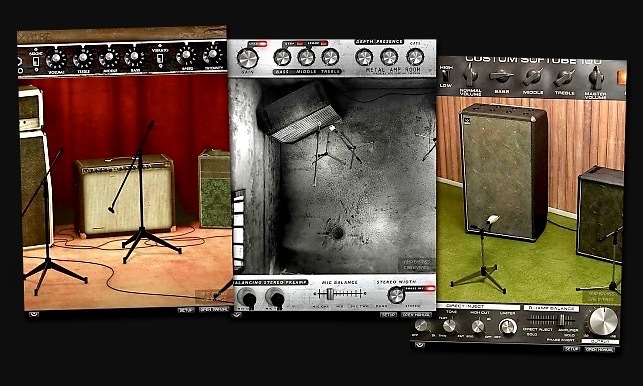 Some software, like Softube's Amp Room, even lets you move mics around a virtual room. To take advantage of amp modeling plugins, all you need to do is plug your guitar straight into your audio interface. This is where those dedicated instrument inputs come in handy—they’re optimized for the high impedance and low voltage put out by guitars, so you can start off with a clean, strong signal. And, of course, you can still use any pedals you have—just adjust the preamp gain so the signal isn’t clipping at the interface. For a smooth experience playing through amp modelers, you’ll need two key things: low latency and decent processing power. Latency is the amount of time your guitar signal takes to be converted to a digital signal and back to analog, and even a few milliseconds can cause a distracting audible delay. Latency can be reduced by using a fast connection like Thunderbolt or USB 3.0 and setting a small buffer size in your DAW. Processing power is the amount of resources your computer has to run your amp simulation plugins, which can be fairly demanding. Fortunately, most modern computers should be able to keep up. Want to learn how to record more than just your electric guitar? Check out our guides on the Easiest Way to Record Your Synthesizer and the Easiest Way to Record Your Acoustic Guitar. For more tips about home recording, see our Home Recording Basics series.